Trekr Adventures helps people connect, travel, and experience the world with like-minded individuals. We organize trips of a lifetime while fostering an inclusive and fun atmosphere. Our flagship sailing adventure trips take place on luxury style catamaran yachts in exotic locations, with the overarching goal of fostering a community environment that lets everyone have a fun and relaxing time, all while traveling to destinations that are both interesting and unique. This page will catalogue our past Treks so that future customers can have a window into the community Trekr fosters with the background of the exotic locations that bring us together. 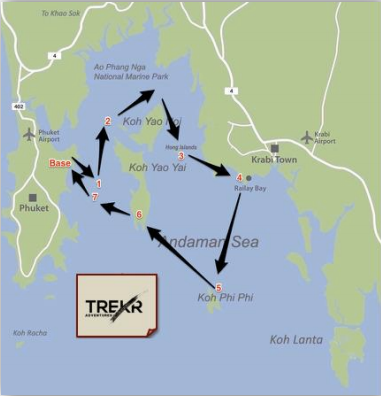 Trekr Adventures' inaugural Trek was in Thailand in December of 2015. It was clear after the experience that this is something we would continue doing. We visited a different island off the coast of Phuket each day, exploring the beauty of the islands and the friendly spirit of the Thai people. We saw such a diversity of sights along the way. There was a Muslim village where we had lunch and canoeing through a network of caves. The fire dancers on Ko Phi Phi and the solitude of Paradise Island provided a contrast of experience. Secluded dive sites and readily available snorkeling were a complete delight. We anchored in secluded bays and moored in popular marinas. The inaugural sail in Thailand was a beautiful balance of everything you would want in an adventure. Following up our inaugural trip to Thailand, Trekr headed to the beautiful southern Dalmatian Islands off of the coast of Croatia. The cobalt blue of the Adriatic sea wooed us as we sailed from island to island, admiring the gorgeous islands, the enduring beauty of the architecture and the voluminous history of every place we visited. Trekr headed to the Abacos in February 2017. Each day we sailed to multiple parts of the Abacos, seeing various landmarks and attractions and going on excursions such as fishing, Giant Caribbean Lobster hunting, feeding sharks and stingrays. In August and September 2017, Trekr headed off to Greece for three back to back Treks! Each week included pre-and post excursion adventures, including a tour of Athens and a post-sail trip to Santorini! Summer on the Mediterranean Sea is one of the top sailing experiences of the year. Average wind speed is 10 knots. You can enjoy the beauty, culture and cuisine of the Greek Islands while enjoying the sailing life with friends old and new. Start your day with a dive into the warm waters of the Mediterranean. Continue the day by exploring the offerings of each day's destination. We went back to Thailand in December 2017 for two back to back Treks. In addition to the sailing adventure, we added a post-sail excursion to Cambodia and Vietnam. Papeete on Tahiti is the capital. Within the Society group are Bora-Bora, Raiatea, Tahaa, and Huahine, the jewels of the exotic Tahitian sailing vacation. Because the islands are downwind from Tahiti they’re known as the Leewards. The mountainous heights rise from the sea atop what remains of ancient volcanoes so old the craters have all but eroded into oblivion. Encircling barrier reefs provide a habitat for sea turtles, sharks, dolphins, porpoises, colorful hard and soft coral, and more than 500 species of fish, making the Tahitian Leewards one of the world’s top snorkeling and scuba diving venues. Resorts, watersports, island tours, archaeological sites, and fine dining are just some of the delights of a Tahiti sailing adventure.